Should you really be trying to predict demand for spare and legacy parts? 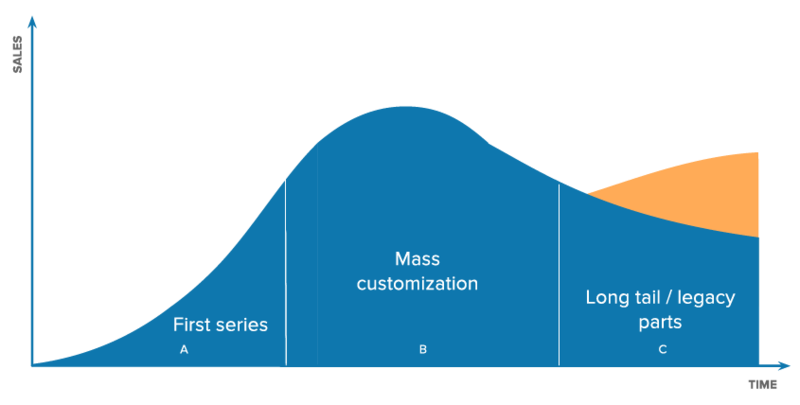 Since we founded DiManEx a few years ago, I’ve spoken to hundreds of supply chain leaders who struggle with a common question: how can we use our data to predict demand for spare and legacy parts? The question is ever more pressing for Original Equipment Manufacturers (OEMs) and service organizations, which are often required by law to keep a supply of spare parts and combat product obsolescence at the same time. This undoubtedly makes complete sense from a customer service and environmental point of view. But does it make sense to try to predict demand for these parts, which will almost always be uncertain? What of the resulting waste and high inventory costs that come with (over) stocking parts at the end of the manufacturing life cycle? Additive manufacturing, embedded in a digital supply network, offers a better way. Digitalization is re-inventing the supply chain. As Lora Cecere writes, digital technologies are compelling us to rethink “the atoms and electrons of the supply chain to drive new levels of value.” Faster data processing capabilities and advanced analytics are driving increased supply chain visibility and sharpening forecasts. IoT is improving asset utilization and streamlining the factory floor. Additive Manufacturing (AM) is compelling us to rethink inventory management — do we need to build up physical stock when we can develop virtual inventory? IDC analysts expect global 3D printing revenues to exceed $35 billion by 2020. Undeniably, if you’re considering the adoption of AM you should first look at existing supply chain data. AM doesn’t happen in a vacuum. To leverage it successfully, you should get insight into how it could help you improve your total cost of ownership, lessen working capital requirements, and reduce logistics and storage costs. A common starting point for a Proof of Concept is looking at parts that have low utilization but high minimum order quantities. There are also qualitative aspects to consider: are parts serviceable? Is the supplier still available? That said, the real promise of AM is a solution for unpredictability. I find that often companies spend a fortune developing algorithms to predict the future. When it comes to inventory, AM helps you tackle this in a different way: by allowing you to produce only when and where needed. The advantages of embedding this booming technology in the supply chain are clear. Not only does it present solutions to persistent supply chain dilemmas like trimming excess inventory and costs. It allows you to effectively tackle the puzzle of demand unpredictability and avoid spare part obsolescence. Most OEMs and service organizations are not producing their own spare parts today. They rely on suppliers in order to secure their availability. Rather than investing in assets (3D printers) with an uncertain utilization and ROI, such companies can start embedding 3D printing into their supply chain by working with an existing digital supply network. A digital supply network that offers a service for parts selection, (re)engineering, and quality control, and makes use of an established network international AM production partners, helps you virtualize stock and guarantee part availability across the globe with no upfront investments. It also enables you to start leveraging the technology without building extensive know-how about the different techniques and materials in-house. 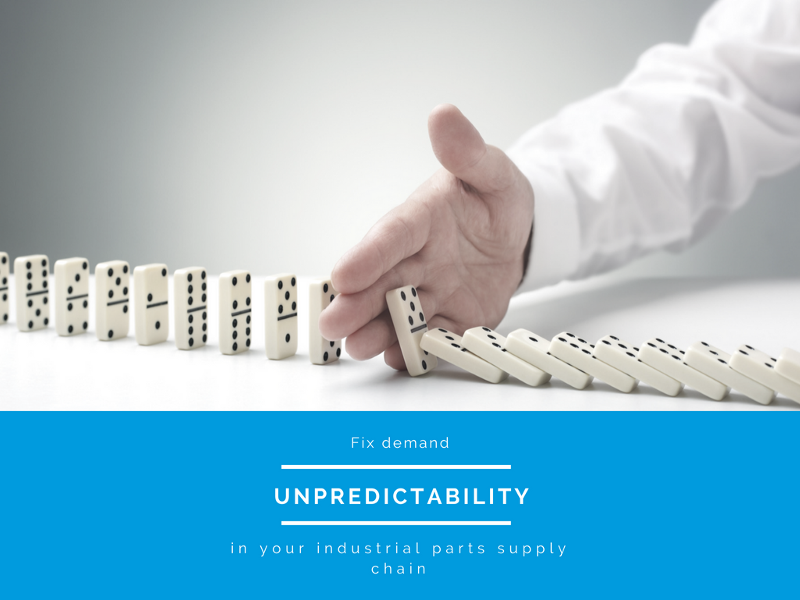 Such a solution closes the loop of demand unpredictability, helping you minimize risks while enabling you to order parts when and where they are needed. Why struggle with unpredictability of demand when you can avoid this puzzle in the first place with virtual stock? Contact us to learn more about DiManEx and how our end-to-end service can help you integrate AM into your supply chain.